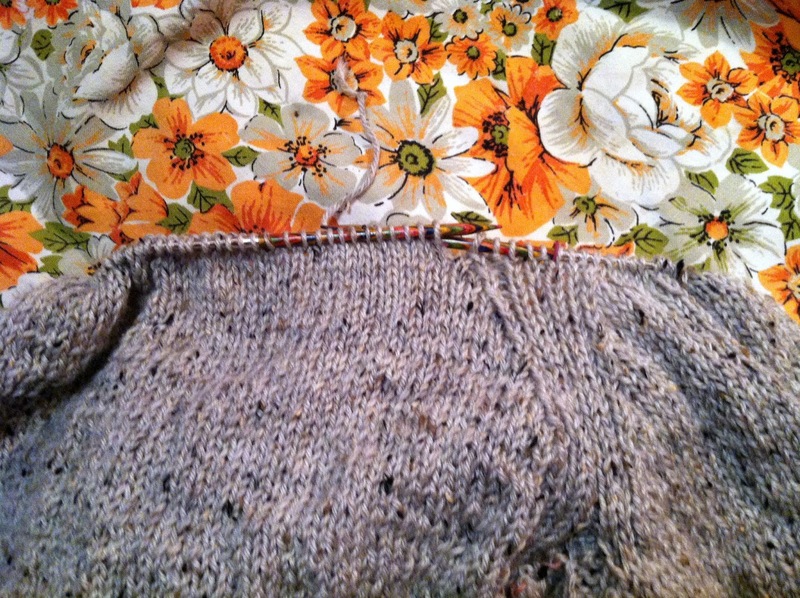 This weekend I went to town on my mum's sweater, and I got the body done and the sleeves joined. Sunday morning I looked at what was done so far and I had the niggling feeling that I wasn't going to have enough yarn. But sometimes you have that feeling and there turns out to be exactly enough yarn, so I kept going. There wasn't enough yarn. Not by a longshot. 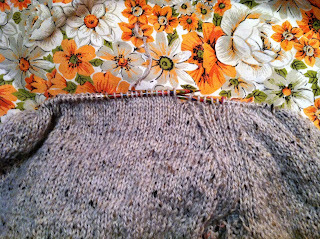 I've got about half the yoke left, and that tiny little tail is all the yarn I've got left. So I've ordered more, and while I wait for it to get here, I'll work on my Filled With Secrets for the Early Check In KAL, and we have a four day weekend for Thanksgiving this week, so I'll have time to get started on xmas knitting, and it'll all be fine. And before long I'll have the rest of the yarn I need, and my mum will finally have a finished sweater. Hopefully before xmas. I always lose at yarn chicken! Sorry you lost at yarn chicken. That is a great tweedy yarn. I'm debating on my jumper whether to rip back to incorporate the second skein that is supposed to be of the same dye lot but is showing up darker even though it's tonal. If it makes you feel any better, yesterday I'd finished my daughter's birthday jumper and then in darning in the ends I pulled the wrong thing, made a hole and now I've had to pull it back to the beginning of the yoke and start again - I feel your pain!! I hate when that happens. Same thing happened to me last month. Hopefully you find some wool, same dye lot.